Verify if you have the last version of Firefox. 2 – Install Xvfb – the X Virtual FrameBuffer. This piece of software emulates the framebuffer using virtual memory which lets you run X-Server in machines with no display devices. This service is required to make browsers run normally by making them believe there is a display available. If there was no error on the terminal, then you have successfully running firefox headlessly in Ubuntu. The command should keep running until you kill the process by pressing ctrl+ C or similar. There wont be any output. Now, you can run selenium server as you will run in your local machine. I will show how you can search for other property of an element beyond that appears when you query an element with calabash. In Android the Views (also the TextView) can have almost anything as a background not just a color (a bitmap, a shape, a gradient color, etc). Because of this there is no way to get the background color of a view (it is not stored). This is not a limitation of Calabash but the Android system. You can get any property of an Android view if it is accessible. You can identifying the properties of the class if you open the project and open the class file that you want to know the attributes. There you can find the properties that you can filter with calabash too. where row is an number describing the row of the cell, and sec is a number describing its section. In general, you can filter on any selector which returns a simple result like a number, string or BOOL. There are four directions descendant, child, parent and sibling. These determines the direction in which search proceeds. There are three directions descendant, child, and parent. These determines the direction in which search proceeds. this means “first find all linearLayouts, then inside of those, find all the editText views”. The key here is the word inside. This is determined by the query direction. Hii guys, you know how is hard test cross-browsers. We have a lot of problems with versions of different browsers, different SOs and for this huge possibilities it is impossible to test your automation in every browser with all possibilities of SOs and configuration. Spoon.net is a browser sandbox (currently Windows-only) to test or deploy multiple versions of current, beta or legacy web browsers without maintaining cumbersome virtual machines. Just log in, install a small plugin, select the browser you want to test and it will launch instantly. Because Spoon.net runs the applications in isolated “sandboxes,” you can run multiple applications side-by-side without any conflicts or dependencies. IE NetRenderer allows you to check how your website performs in Internet Explorer 5.5 through 11. Just type in your URL and see how your website appears in common IE versions. Once rendered, you can choose between nine versions of IE, and you’re presented with the processing time of the request and the dimensions of your website design. In this site below you can find 13 tools, but I just chose these 8 because I think that are the most relevant of the research. Hi guys, to everyone is having this problem I just have the solution for the moment, we are waiting the new release of calabash/Xcode with the issues fixed. Gem needs a manual update for Xcode 6.0! 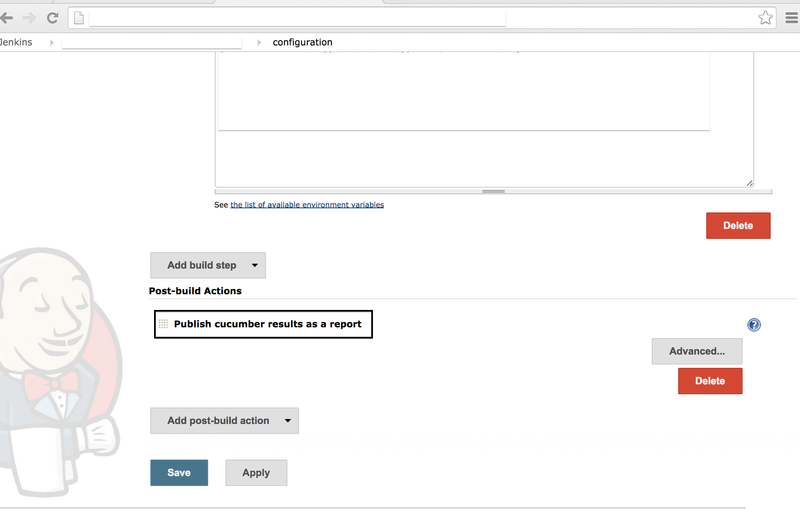 I will show how configure your calabash automation and your git repository on a jenkins job in only 9 steps. 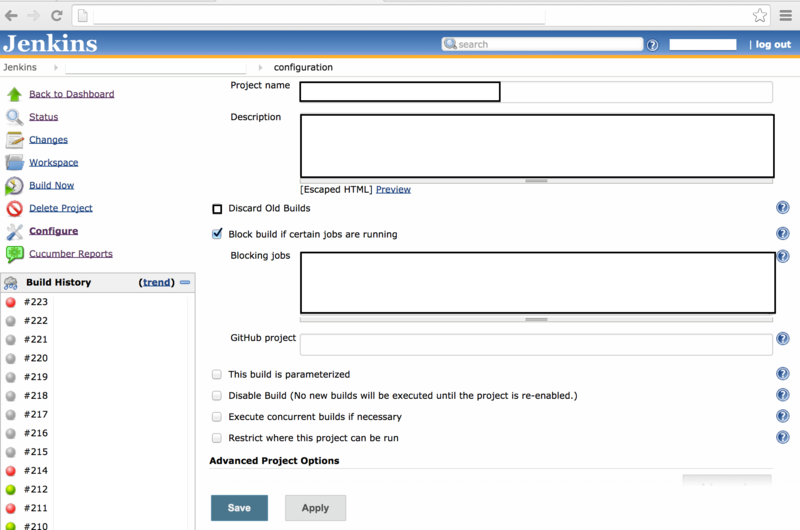 First – Create a new job and write the project name, description and Blocking jobs (If you have any, check the block build…). In this step you can choose if you want discard the old builds or not ( I advise to not discard, it is good maintain as an evidence). 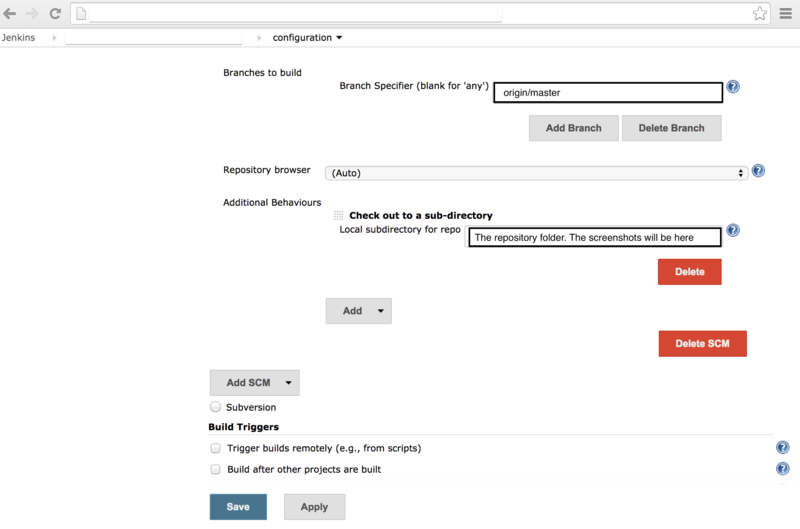 Git hub project: Write the URL of your project on github and the other options about your build (generally you don’t need to check). 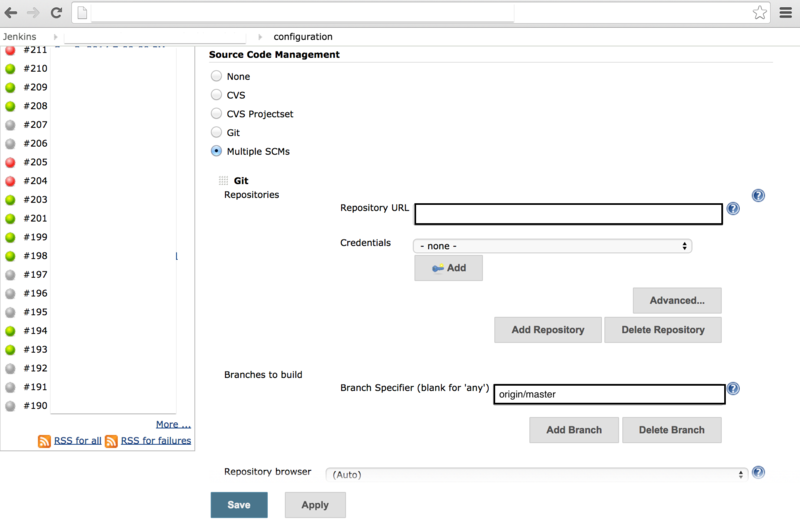 Second – Source Code Management, you need to choose if will be one or multiple repositories (Multiple SCMS in this case). After, you write the Repository URL (Example: https://github.com/xxxxx/XXXX.git), put your credentials (if you need some to clone the repository) and click to Add, If you are using multiple repositories you can add more on Add Repository button. Third – Now you write the build app folder, where the build will be. 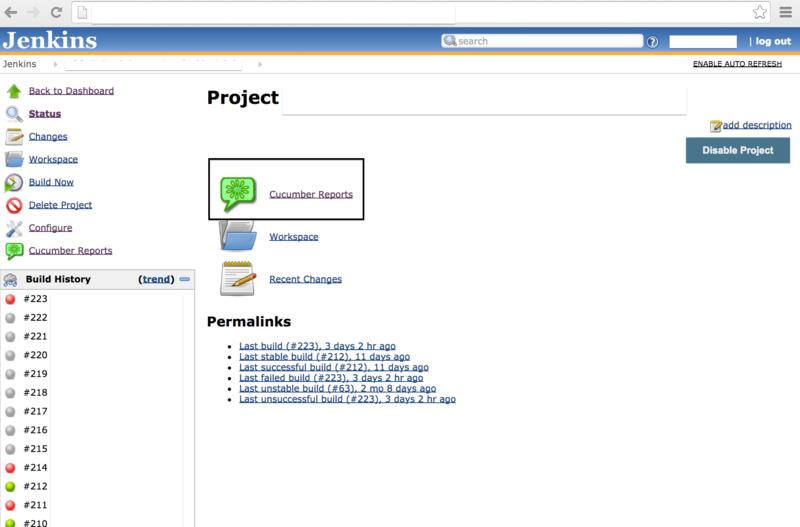 After, you need to write the repository of your automation project and choose your credentials if you need one. 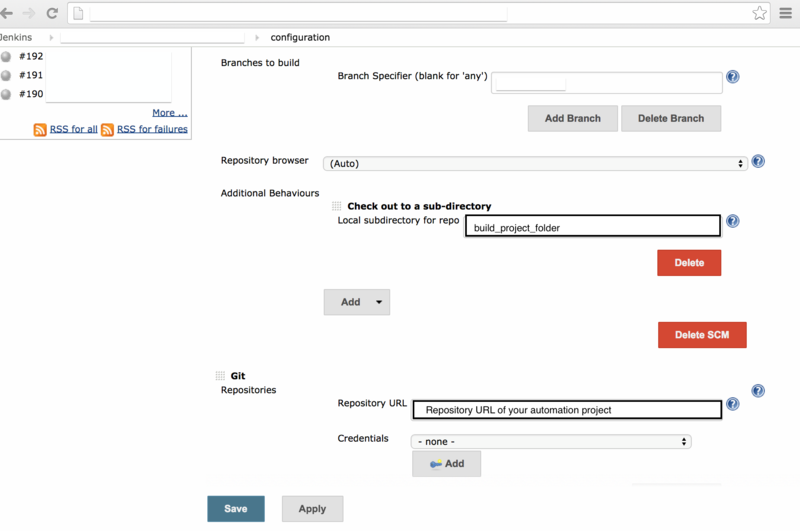 Fourth – Choose the branch of this SCM – calabash automation and the repository folder. Fifth – In this case we are building this job periodically everyday in the evening. You can schedule the build here. Follow the example and the instructions. 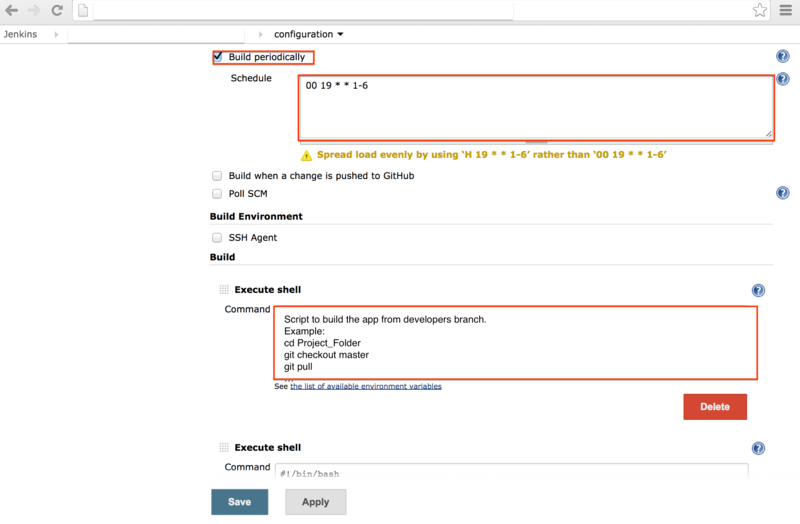 If you want run this job after someone pushed to Github, just check the option “Build when a change is pushed to GitHub”. In this field, you can write the script to pull, checkout and build the app from developers branch. 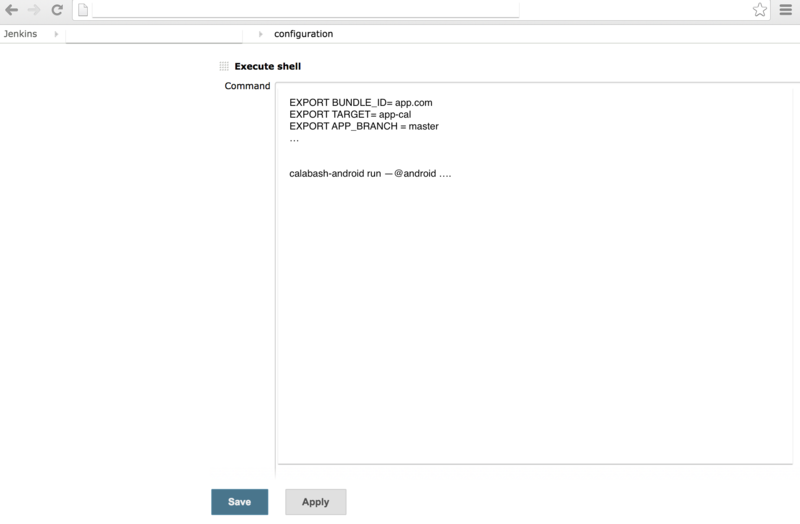 Sixth – Now you need to export the variables, as target, app_branch, bundle_id and everything. After you can write the command to run the calabash and the test. Eighth – After run the test, click on last build and on link Cucumber Reports. 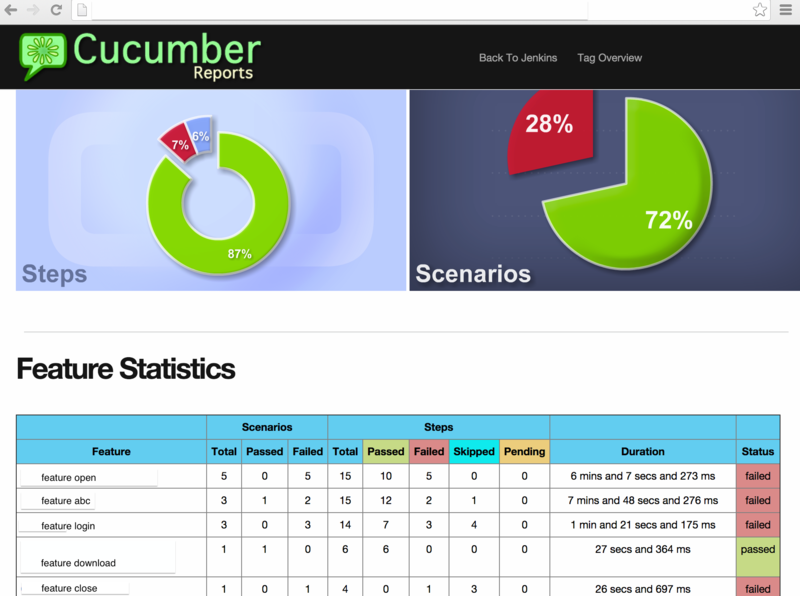 Ninth – You can see the report and how long is delaying each feature, how many scenarios of each feature failed and passed. If you have any question or suggestion just write below in the comments.